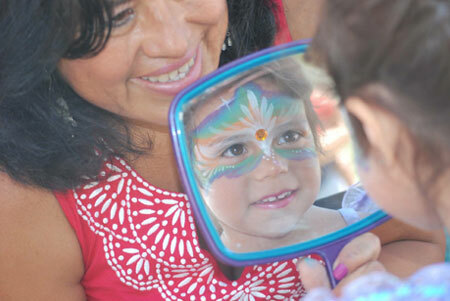 At Face Painting & Body Art by MC, we offer professional face painting in North San Diego County and its surrounding areas. 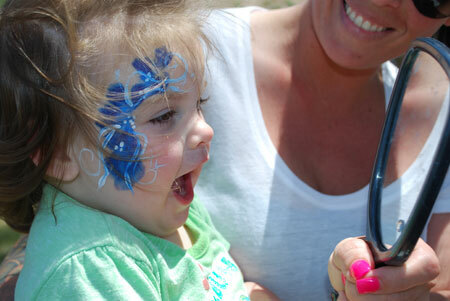 We create colorful and vibrant face painting designs for all of our clients, regardless of gender or age. Everyone who experiences our face painting services is guaranteed to enjoy every second of the journey. Through our dedication and competitive prices, your events will be remembered for years to come. Face painting is an extraordinary way to add a little fun and flair to your next celebration. Imagine a young batman or fairy princess enjoying his or her birthday party; we can transform your guests into anything they can imagine! Our talented team of face painters has many years of experience and creates stunning and unique designs at a fast rate. We can usually paint between eight to fifteen faces per hour, depending on the complexity of the design. Please consider this when booking to allow each guest to have a special experience. You can also estimate about five minutes per person. We only use professional, water-based FDA-compliant cosmetic grade face and body makeup that is safe for skin and even around eyes. It washes off easily with soap and water. We are passionate about what we do and we guarantee to provide top quality service every time. In need for a one-of-a-kind costume? Face Painting & Body Art by MC provides special Halloween make-up and body art services for your next party! We are passionate in bringing your vision to life. We take pride in our detail-oriented designs and find creative ways to achieve either a spooky or beautiful outcome. You pick! 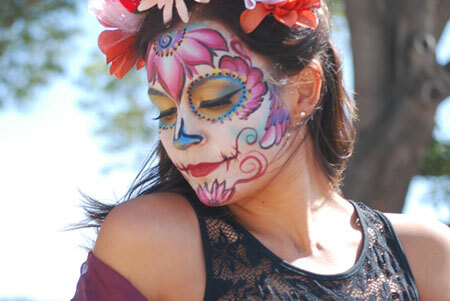 We also specialize in breath-taking sugar skull designs for Day of the Dead. You can find us at local events and we even offer private appointments. Please remember, we are very popular during October/November due to Halloween and Dia de los Muertos; contact us in advance to ensure your appointment. Glitter tattoos are a great addition to a beach or pool party! These glittery designs are a big hit with any age. We provide stencil and free-hand tattoo designs.